The annual Harvest Festival is coming up on Saturday and Sunday, August 16-17, 2014, at Wildlife West Nature Park, in Edgewood. It’s a time to celebrate the area’s culture, traditions and agricultural heritage. Visitors will experience the rich history of the pinto bean farming in the Pinto Bean Museum, which displays antique bean processing equipment, farming artifacts and historic local photos. The Northern Rio Grande National Heritage Foundation provided funding for the museum and the collection of farming equipment. The Festival opens on Saturday morning with a tractor parade beginning at 9 a.m. at Wildlife West, traveling west along historic Route 66 and ending at the Tractor Supply Company. The tractor games will be held on Sunday this year, beginning at 2 p.m. on the field in front of the historic Pinto Bean Barn. Visitors can stroll through the park and have fun experiencing an old west atmosphere. They can explore a replica of the western town of Venus (original name of Edgewood), and see blacksmith demonstrations, weaving and spinning demonstrations, and antique cars and trucks. Also on showcase will be old iron tractors, steam engines, corn shellers and other historic ranch equipment. Other activities include behind the scenes black bear tours, snake and reptile identification presentations by the New Mexico Herpetological Society, and artistic chainsaw techniques demonstration by Mark Chavez, renowned chainsaw artists. Then take an old-fashioned hayride around the park. There will be games for children, opportunity to experience wildlife up close, and artists and vendors. Anasazi Fields Winery will be on hand on Saturday for wine tasting. Throughout the weekend, the Knights of Columbus volunteers will serve up pinto beans, fresh sweet corn, and hamburgers and hot dogs. Don’t miss the Chuckwagon Dinner Show on Saturday, 6 – 9 p.m. Come early for the activities during the day and stay for the evening free-flight peregrine falcon show, pie auction, barbeque dinner and Holy Water & Whiskey western-swing music concert. Reservations for the dinner show are required by 2 p.m. on the day of the show. Chuckwagon tickets are $25 for adults, $23 for seniors, $12 for children 5-11, and kids under 5 are free. All activities throughout the weekend, except for the Chuckwagon dinner show, are included with regular admission to the park: $7 for adults, $6 for seniors, $4 students and children under 5 are free. Music performances are presented in a covered all-weather amphitheater. Plus free dry camping and parking. Wildlife West is located just 25 minutes east of Albuquerque, off Interstate-40 and legendary Route 66 in Edgewood. For more information at visit http://www.wildlifewest.org or call 505-281-7655 or toll-free 1-877-981-WILD (9453). I have attached the flyer for the national Night Out and Movie night the Police Department will be holding on Tuesday August 5th beginning at 7:00 PM at the Athletic Fields here in Edgewood. Please stop by and enjoy the evening with us. at his business Mail and Copy. Vice President Robin Markley, owner of BeeHive homes will assume the responsibilities of President until January of 2015, when the board will elect a new set of officers. Chris, we all appreciate the hard work and dedication you have devoted to the Chamber and thank you for all you do! What a wonderful demonstration by the talented children who attend Sigalas! Our hosts Nicole and Mr Sigala were very gracious and those who attended received a wonderful gift from Sigala’s. We are proud to have you as members of the Chamber, and recommend that all members stop by to see just what they offer the community. All ages are welcome. Also, thanks to State Representative Jim Smith and Town Councilor Rita Loy Simmons for attending. The evening was unique and fun! Tell folks you know that the survey is available on the Edgewood Chamber website, and on the Town of Edgewood Website under Economic Development as well as here. We’re hoping to announce our very special guest speaker next week soon. Chamber decals for members to place in your windows to announce that you are serious about your business and have joined the Edgewood Chamber of Commerce! Children 8 and under admitted FREE. AT THE RANCH ON BARTON ROAD. GREAT ENTERTAINMENT FOR THE WHOLE FAMILY! is in need of volunteers. 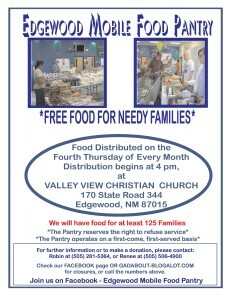 food pantry, thrift store, donation intake and sorting areas. Volunteer orientation is held every Thursday at 10 am for ages 14 and up. You choose the day, time and project. Bring a friend, or come and make new friends. Call 832-6642 for more info. Covered seating rain or shine! Wonderful way to entertain your summer visitors! Make reservations by 2pm day of show. posting of the Friday Blast,with the understanding that the Edgewood Chamber is an independent organization of local business members. Statements and beliefs on other sites may not be construed as views or positions to which we adhere or agree. Mayor Howard Calkin’s 90th Birthday. from 1 to 3 after the regular luncheon at the Community Center. (he isn’t online, and won’t see this). Since we’re a one person office, when we have other meetings or members to visit, we’re not here. Call 850-2523 and we’ll be sure to meet you! Will There Be A M”E”SD? Who can say what will happen should MESD carry through and shutter Edgewood Elementary? Personally, I would like to see Moriarty and Edgewood grow together in a mutually beneficial relationship, but MESD seems bent on biting the hand that feeds it. The Great Depression couldn’t kill Edgewood’s school or community spirit. The old Edgewood Schoolhouse was built as part of Roosevelt’s Works Projects Administration and community members joined together to construct the school from indigenous materials on land donated by the Bassett family. That school served generations of Edgewood families from 1938 to 1960, but after consolidation into the Moriarty District, the Edgewood school was shuttered and the community suffered a near death. By the late ‘60s, Edgewood had only an RV park, Paula Donner’s Realty, and the Horn gas station on its main street to serve as a reminder of its former days. Once I-40 opened, Edgewood saw the addition of businesses on the four corners of the interchange, which brought new families and construction into the community. Within just a few years, Edgewood experienced a surge in population and Moriarty was too small to handle the load. A new Edgewood Elementary had to be constructed and only a few years later, an annex had to be built to keep up with the area’s growth. Having their own school once again was cause for celebration. A revitalization of creative energy followed. Many artists began calling Edgewood home. New businesses were established and a new vision of Edgewood’s future rose from the dust. Now it seems as if we’ve come full circle and are threatened once again with losing our elementary school. But rather than being prompted by declining enrollment or poor performance, the closure of Edgewood Elementary is based solely on finances. Evidence supporting the stated concerns of shuttering by Edgewood’s Town Council and Chamber of Commerce abound. So, do we want a school district unwilling to invest in the welfare and future of the community? Faced with these questions, Edgewood residents have legitimate reasons for concern that have not been addressed by MESD. But having faced these questions before, they have proven their willingness and ability to rebuild their future, literally out of the very dirt beneath their feet. How does that benefit MESD? The short answer is: it doesn’t. Economic DevelopmentThe EDC research study is happening now! what would you like to see in Edgewood’s future? click below and fill out the form interactively online! After the data is gathered, we will prepare an Economic Impact Preparation Report which will be used by our committee and leaders to determine what’s next for Edgewood! make sure you are utilizing the services to which you are entitled! And if you would like to become an Ambassador, please let us know in the office! wall on the front of Midway last Saturday! Domino’s Pizza, Windmill Water, The Town of Edgewood, Bill Gilmore, and all who helped to make the Midway Post…half way between Arizona and Texas on Route 66…a little better. Exciting news for Whiting Bros! Zeon inspected the high sign at Whiting Bros. over the weekend and came to the conclusion that a catastrophe could occur if an attempt was made to remove it from the poles. They are more comfortable sending a crew to Moriarty to do the work in place. The sign will be strengthened and restored right before our eyes! and is anxious to see work begin! Balloons Refreshments And a big Sale!!! We are celebrating 4 years of serving our friends and neighbors in the East Mountains. Please invite your friends and neighbors to join us – we look forward to seeing you! SASS who will tell us about “End of Trail” coming in June. We had a great mixer last evening at the Chamber office, thanks to hosts Chris and Catherine Hopper from Mail and Copy Business Center! That BBQ pulled pork was very good, and so were the rest of the goodies you put together! A big thank you to our speaker Danyell Sena, Manager of the Comfort Inn in Moriarty who did a fabulous job presenting her enthusiasm and excitement about the historical route 66 information in our area! Their hotel has increased its revenue because of their participation in all things Route 66! As visitors increase to our area, we should all be thinking about how we can help them to have a positive experience! That directly becomes a plus for your bottom line! We are bringing in decals for your window or door to announce that you are serious about your business and have joined the Edgewood Chamber of Commerce! The EDC research study is ready to go…. If you would like to fill out a questionnaire about what you would like to see in Edgewood’s future, email the office and we will email you the form. All information is anonymous, so be sure to answer all of the questions. We want to prepare an accurate report, and we want to hear from everybody! We will also be forming focus groups, and doing interviews with leaders at the state, county and local level. Deadline for all information is May 15. (Smiths Grocery Store) with Route 66 (Hwy 333). Sandia Laboratory Federal Credit Union. Fridays by appointment. Call 850-2523 and we’ll be sure to meet you! 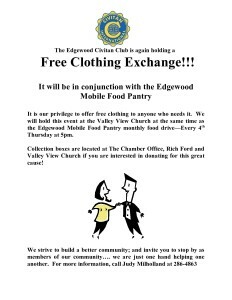 In response to the Edgewood Town Council’s Resolution 2014-01, we have formed a group called Edgewood Moving Forward. Our goal and mission is to create an Edgewood School District separate from the current school district. We have a vision for our children’s education. We invite you to learn about this vision at the town hall meeting that will be held on Saturday, April 12th at 3:00 pm at Edgewood Middle School. We believe this is the time for Edgewood to Move Forward and take charge of our childrens’ future. We hope to see you there. **Please help spread the word about this meeting. Please forward this email to friends and family that might be interested in attending. Thank you. There are municipal elections throughout the Estancia Valley & Tijeras from 7 AM to & PM today. Please use your privilege to elect the candidates of your choice. It is that time again. I currently serve as a councilor on your Edgewood governing body, and have done so since 1999, except for a two-year hiatus. During the two years I was absent from the town council, I remained active working hard to improve Edgewood’s financial well-being while planning serious town projects for future benefit. I was re-elected to a new four-year term in 2010 and it is that term which will end this coming March 4th. During the preceding four years I have been privileged to work with a dedicated council eager to see Edgewood become the community it seems destined to be. Roads have been paved and maintained far beyond what had occurred since Edgewood was first incorporated. During the last four years your governing body built a public works facility which allows your dedicated employees to maintain road and similar equipment under the comfort of heated space or cooled space depending on the need of the seasons. The town governing body, its staff and our volunteer planning and zoning commission, formulated a renewed plan for Edgewood Commons (also known as section 16) which along with revised zoning and sub-division ordinances will become the guide for Edgewood Commons and some other areas in our community. Edgewood’s Police Department is under new direction by your police chief Fred Radosevich. Improvements in supervision and other facets of the department’s operation have been made and will continue to be made during the future. During the coming years, Chief Radosevich will make training, equipment and personnel additions to see our department keep pace with the needs of a safe community. I retired as Captain in charge of the New Mexico State Police Criminal Division in 1985. Prior to my retirement from that agency I attended and graduated from the Federal Bureau of Investigation’s National Academy, the Drug Enforcement Agency’s Academy and obtained accreditation at the Executive level of New Mexico’s Law Enforcement Academy. The training and accreditation will continue to be helpful in ensuring Edgewood has fully trained and professional police as the governing body seeks to assist our Chief of Police. Edgewood has been fortunate to have the Mountain & Valley Family Health Care Facility (FCFHC) here since 2003. What came as a 7800 square foot medical, dental and mental health services facility has outgrown its present space and plans are to construct a new health commons of approximately 42,000 square feet with an urgent care component, and other ancillary services, such as a community wellness center open to the community. The facility presently employs over fifty dedicated providers and staff. Total employment will reach over 100 once the new facility is completed. We believe the facility will continue to partner with the University of New Mexico in medical provider training. Edgewood recently joined with the Edgewood Chamber of Commerce (ECC) in formalizing a memorandum of understanding allowing ECC to organize as Edgewood’s primary economic development organization. ECC is organizing for recruitment of businesses, services and other vital needs with economic components. We expect to see firm results though ECC’s efforts. I have served on various committees during my tenure as a town council member and currently (Since 2003) serve as a “consumer” member of FCFHC Board of Directors. I continue to serve .on the Northern Region Transportation District Board of Directors which provides transportation to and from Edgewood with a mid-day service to be added soon. I currently hold certification as a graduate of the Municipal Officials Leadership Institute under the auspices of the New Mexico Municipal League and I will continue to improve my knowledge and efficiency with in-service training. I humbly ask for your vote during this election cycle ending March 4th. In turn, I will continue to serve you with honesty, integrity and full dedication.